READY TO PLACE BETS ON A RACE AMONG MYTHOLOGICAL FLYING CREATURES? Zeus invited you, along with a bunch of other divine friends from all around the Multiverse, for a little get-together on Mount Olympus. After a legendary lunch and a few rounds of Ambrosia, the drink of the Gods, you start arguing. Which mythic creature is the fastest? Is a Pegasus a better flyer than a Lamassu? Can the fire-breath of a Dragon stop a Phoenix? You start making bets, and soon you decide that the only way to know who is right is to summon all those creatures for a good race...and soon the racing and high risk betting begins, with the Olympic "All-Father", Zeus, as the ultimate judge. 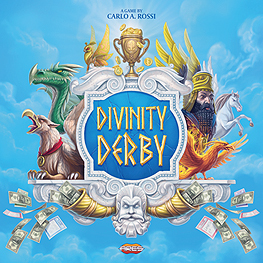 Original mechanics make each game of Divinity Derby a unique experience - your hands of cards are shared with your neighbours, so you can decide how much to cooperate or compete with them, when playing those cards to move the creatures in the race; hidden bets allow you to bluff your way to victory; bets of different values allow you to pursue a safer, or more daring, strategy. Optional rules add special powers to each different divinity portrayed in the game, making the game even more wild and unpredictable. Contents of the box: Rulebook, 1 Board, 6 Cardholders, 54 Movement cards, 4 Zeus protection cards, 66 Bet cards, 18 God power cards, 6 Creature miniatures, 6 Miniature bases, 6 God tokens, 6 Fate tokens, 24 Creature tokens, 1 First Player token.